If you go into an Orthodox Church between 2 PM on Holy Friday and Easter midnight, you will certainly see a table in the center of the nave with a huge cloth embroidered with gold and adorned with beads and gems. If you take a closer look, you will see a half-naked dead man on that cloth. The cloth is called the Holy Shroud, and the man is no other than Jesus Christ. 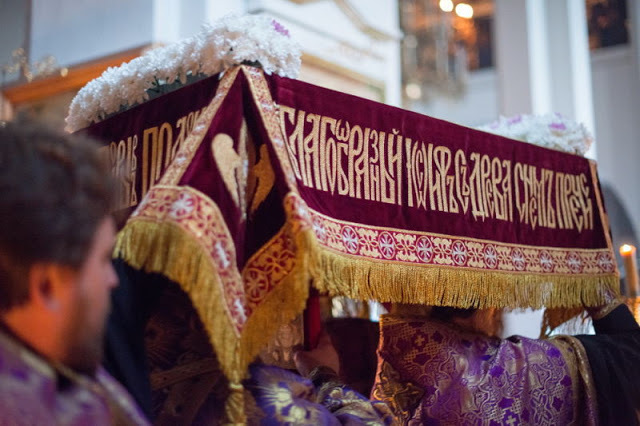 The tradition to bring the “Lord’s burial cloth” to the center of a church is fairly recent. It was around the 14th century that a small napkin with an image of the dead Savior started to be used during the Matins of Holy Saturday (i.e., on Friday afternoon). This napkin covered the Gospel book during the procession with the Gospel to point at the fact that the Lord’s body was already in the grave and His soul was descending into the Hell. It was around the 16th century that the napkin turned into a big cloth, which we now know as the Shroud. At first, the Holy Shroud lay on the Holy Table in the sanctuary during the entire Bright Week, and later it was left in the sanctuary until the Ascension. By that time it was not just a piece of fabric with the image of Christ; it was a veritable masterpiece of weaving art, adorned according to strict rules. The tradition of carrying the “Lord’s shroud” out into the nave for the veneration of the faithful was finally established in the 18th century, at the earliest, and received its modern form by the nineteenth century. 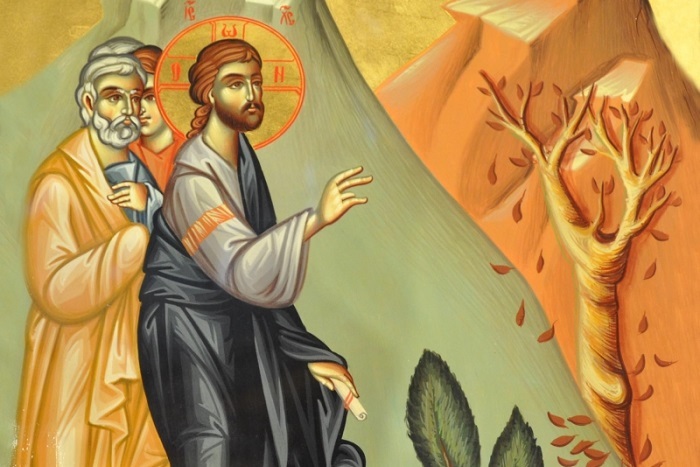 Presently, the image of the dead Savior is carried out of the sanctuary at the end of the Holy Friday Vespers, which is celebrated around two o’clock in the afternoon, at the time of the death of Jesus Christ on the Cross. The choir sings The noble Joseph, when he had taken down Thy most pure body from the Tree, wrapped It in fine linen and anointed It with spices, and placed It in a new tomb, while the priests lift the Holy Shroud from the Holy Table, like Golgotha, and move it to a special table, the Tomb, after which all the faithful venerate the reposed Lord. The rite of Lamentation of Christ is performed in front of the Shroud during the Holy Saturday Matins on Friday evening. At the end of this remarkable rite, there is a procession around the church with the Trisagion, normally sung at funerals. Priests lead the procession with the Shroud. This is how believers bid farewell to the Savior and bury Him. The image of the reposed Christ stays in the nave till the Easter Matins (Sunday midnight) and then the Shroud is taken back into the sanctuary and placed onto the Holy Table where it stays until the Apodosis of Easter (the Eve of Ascension). 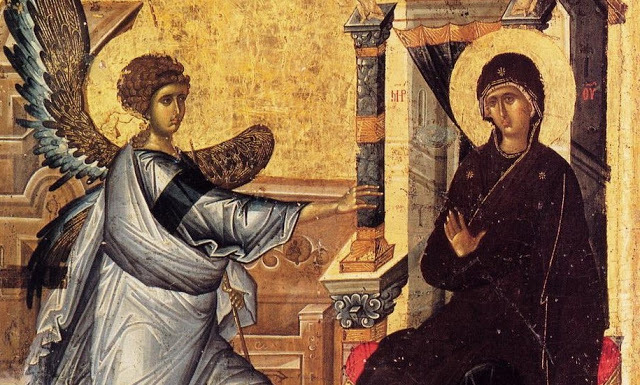 The iconography of the Shroud is very simple. Essentially, it’s a painted replica of the Shroud of Turin, i.e., the winding sheet that covered the Savior’s body and on which an image of the Lord was miraculously imprinted. 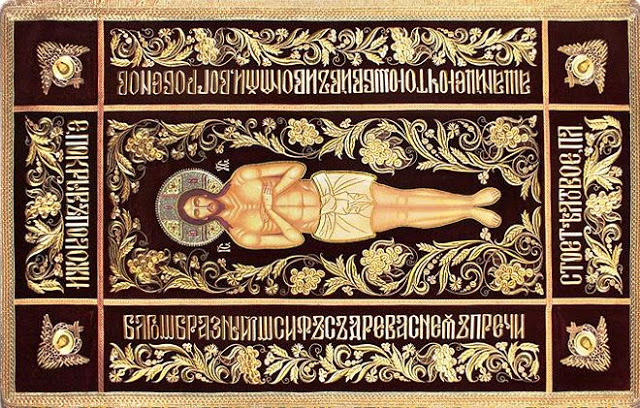 A typical shroud portrays the Savior almost naked, wearing just a loincloth, in the tomb. Sometimes He is surrounded by Angels, Theotokos, and Apostles, although these visual elements are rare nowadays. The edges of the Shroud have the text of the sticheron “The Noble Joseph, taking down Thy most pure Body from the Tree, did wrap it in clean linen with sweet spices, and he laid it in a new tomb” embroidered in gold letters. There are images of the Four Evangelists in the corners (sometimes on separate diamond-shaped pieces of fabric). 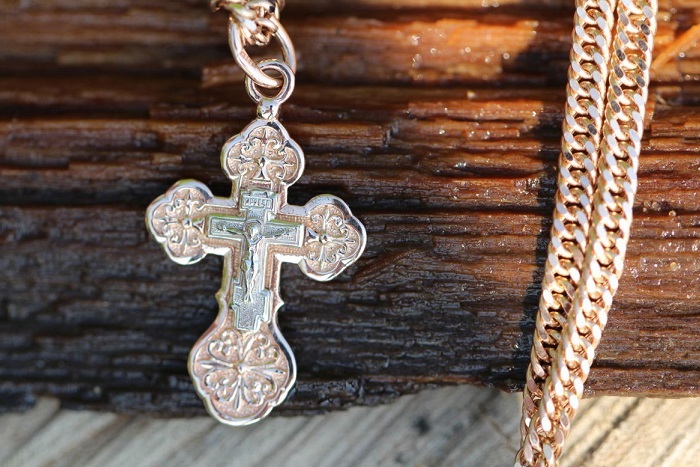 Is It Necessary for the Orthodox to Always Wear a Cross?